Our house lies quite in the middle of Wagrain, just 5 minutes by food away from the centre. Just a few metres from the house there is a bus stop for the free skibus, which will bring you to all valley stations in Wagrain. Winter vacation: Skiing vacation in the heart of Ski Amadè. 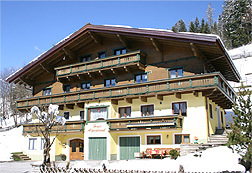 Wagrain lies in the centre of the sport world Amadè. Enjoy the wide range of pistes and other wintersportpossibilities. If you go hiking, or if you just want to enjoy the silence of nature Wagrain will give you the best possibilities to satisfy your needs also in the summer. Wagrain offers a lot of interesting excursion destinations in the summer like the fantastic theme park "Wagraini" on the top of the mountain Grafenberg.